The Barents Oscillation is a wintertime atmospheric mode in the Northern Hemisphere that has implications for the Arctic climate. 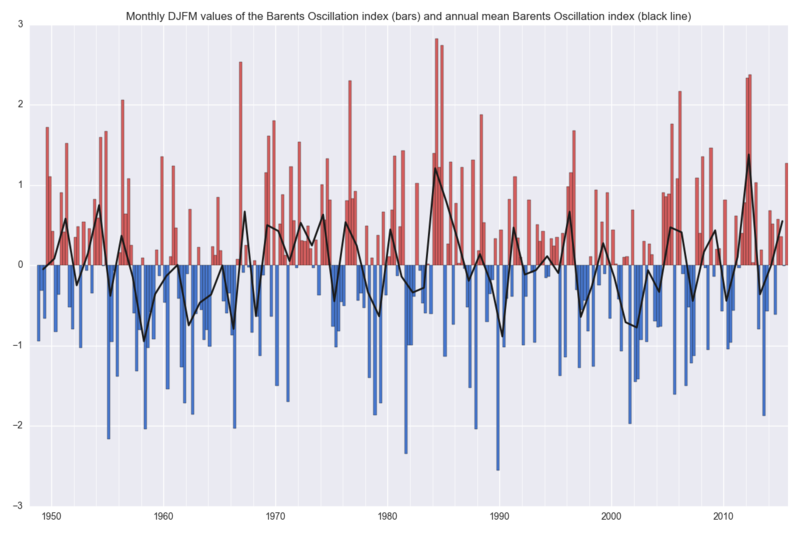 This page contains information about the Barents Oscillation, including its spatial pattern and the Barents Oscillation index. The data are from the study by Chen et al. (2013) [PDF] and are available for download below. Chen et al. 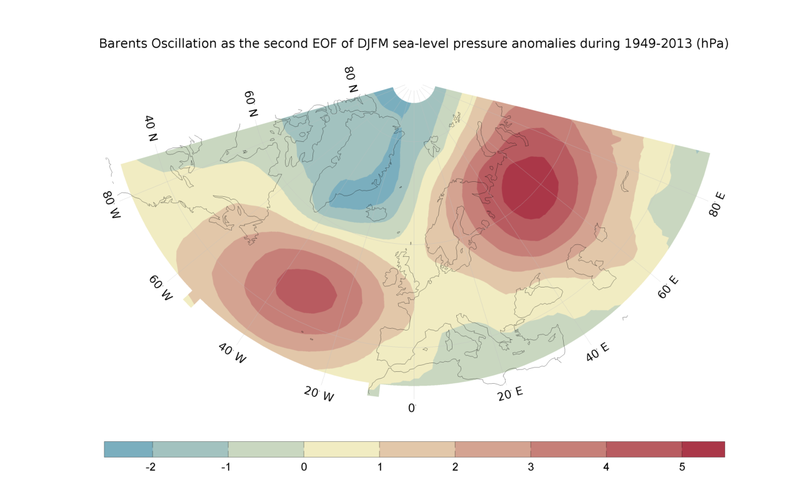 (2013) define the Barents Oscillation (BO) as the second leading mode of Empirical Orthogonal Function (EOF) analysis of monthly sea level pressure anomalies for the winter months December through March (DJFM), in the region bounded by 90°W – 90°E longitude and northward of 30°N latitude. The BO has a primary center of action over the Barents Region, another action center over the North Atlantic Ocean, and a center of opposite sign over Greenland and the Greenland Sea. This mode of atmospheric variability is related to meridional flow over the Nordic Seas and westerly wind anomalies into the Barents Sea. In the study by Chen et al. (2013), the BO was found to be well related to the wintertime surface air temperature anomalies over the Barents Sea. The spatial pattern and BO index on this page are derived from sea level pressure from the NCEP/NCAR Reanalysis 1 dataset over the 1949–2013 reference period on a 2.5° × 2.5° latitude-longitude grid. The Barents Oscillation index is found by projecting monthly sea level pressure anomalies (relative to the 1949–2013 referenc period) in the region 30°N – 90°N latitude and 90°W – 90°E longitude onto the spatial pattern of the BO. 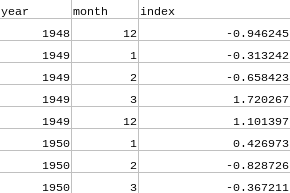 The values of the index from 1948 to 2015 are shown in the interactive graph below. Data and figures from the study by Chen et al. (2013) can be downloaded below for scientific use. We would be happy to hear from you if you are interested in using the data. Just send an email to hans.chen@nateko.lu.se and tell us about your work. Citation: Chen, H. W., Q. Zhang, H. Körnich, and D. Chen, 2013: A robust mode of climate variability in the Arctic: The Barents Oscillation. Geophysical Research Letters, 40, 2856-2861, 10.1002/grl.50551. The data are stored in tab delimited ASCII text files with CRLF line endings. More information about the Lamb classification can be found in Chen (2000). Feel free to contact us if you have any comments or questions. Chen, D., 2000: A monthly circulation climatology for Sweden and its application to a winter temperature case study. International Journal of Climatology, 20 (10), 1067-1076, doi:10.1002/1097-0088(200008)20:10<1067::AID-JOC528>3.0.CO;2-Q. 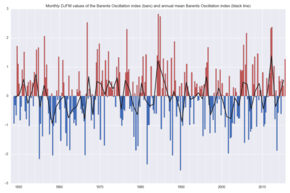 Chen, H. W., Q. Zhang, H. Körnich, and D. Chen, 2013: A robust mode of climate variability in the Arctic: The Barents Oscillation. Geophysical Research Letters, 40, 2856-2861, doi:10.1002/grl.50551. Overland, J. E. and M. Wang, 2005: The third Arctic climate pattern: 1930s and early 2000s. Geophysical Research Letters, 32 (23), L23808, doi:10.1029/2005GL024254. Overland, J. E. and M. Wang, 2010: Large-scale atmospheric circulation changes are associated with the recent loss of Arctic sea ice. Tellus Series A – Dynamic Meteorology and Oceanography, 62 (1), 1-9, doi:10.1111/j.1600-0870.2009.00421.x. Overland, J. E., M. Wang, and S. Salo, 2008: The recent Arctic warm period. Tellus A, 60 (4), 589–597, doi:10.1111/j.1600-0870.2008.00327.x. Skeie, P., 2000: Meridional flow variability over the Nordic Seas in the Arctic Oscillation framework. Geophysical Research Letters, 27 (16), 2569, doi:10.1029/2000GL011529. Tremblay, L.-B., 2001: Can we consider the Arctic Oscillation independently from the Barents Oscillation? Geophysical Research Letters, 28 (22), 4227-4230, doi:10.1029/2001GL013740.